This modern, three-bedroom Barcelona apartment is located in the Barceloneta area, only minutes from the Barceloneta beach and a short metro ride from the city center. It is surrounded by many cafés and restaurants and at night this area becomes quiet with little traffic. If you want to experience the unique Barcelona nightlife, you can find it only a 10 minute walk from the apartment. The apartment has an up-to-date colour scheme and modern design. The living room has comfortable sofas and a sofa bed. 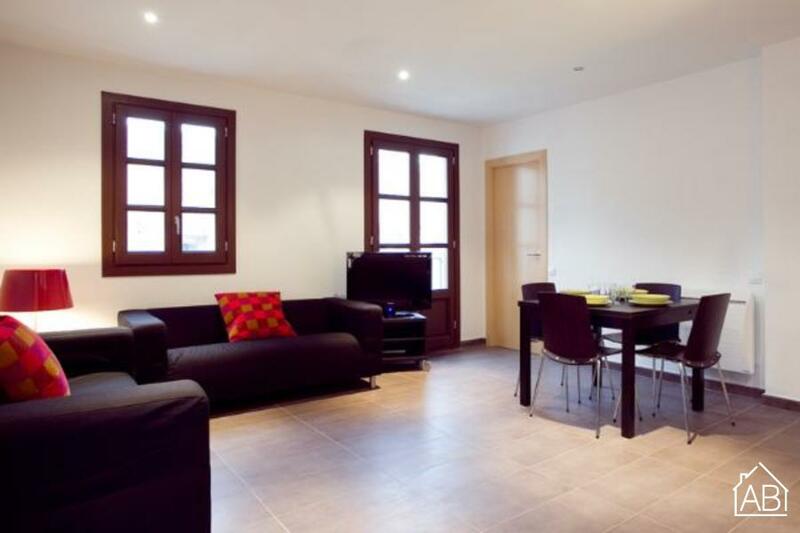 It also has a TV with satellite, a dining table, and access to the baclony overlooking a typical Barceloneta street. The fully equipped kitchen has all the appliances you will need to prepare a delicious home-cooked meal, including an oven, refrigerator and microwave as well as pots, pans and cutlery. With three spacious and bright bedrooms, this beautiful apartment can sleep up to six people. One of the bedrooms has a double bed and the other two have single beds. The bathroom is very well-decorated with a walk-in shower and continues in the same style as the rest of the apartment. This lovely apartment is in a fantastic location and has heating, air-conditioning and a washing machine for your comfort and convenience.